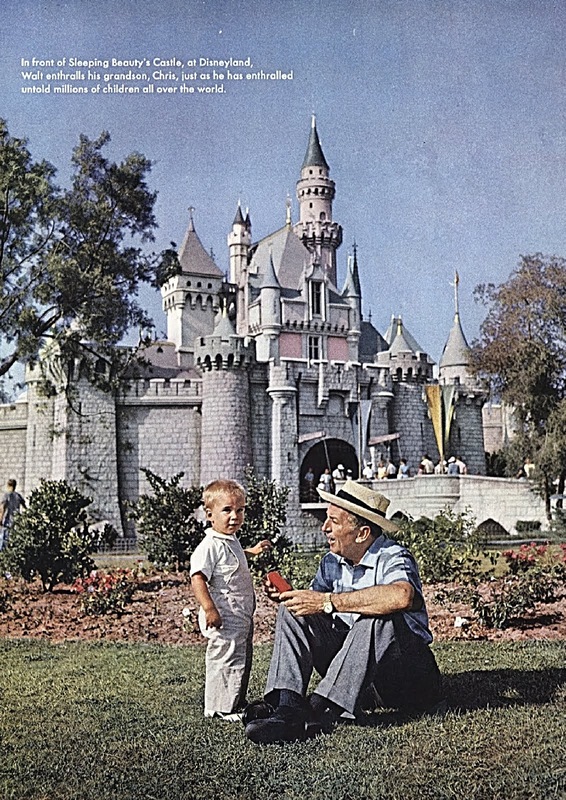 On January 5, 1957 the Saturday Evening Post published the 8th and final installment of "My Dad, Walt Disney" as told to Pete Martin by Diane Disney Miller. These articles were later compiled and expanded upon to be published later in 1957 as a book, The Story of Walt Disney by Henry Holt. I first wrote about this article for the WDW Fan Zone, you can find the article here. Walt didn't like to talk about himself much, so he suggested the Saturday Evening Post interview Diane instead. I am so glad they took his advice, it is wonderful to hear about Walt from the viewpoint of his daughter. She is very candid, and shares some wonderful family stories. There are great pictures of the Disney family, one of my favorites has Walt in a hammock playing with one of the family dogs surrounded by Diane's husband, Ron Miller, Sharon, Diane holding her young daughter Joanna, and Lilly holding little Chris. 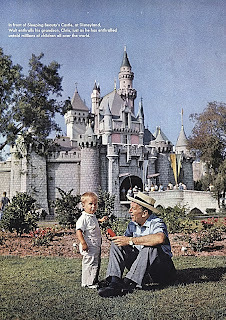 I particularly love the one of Walt with his grandson Chris by Sleeping Beauty Castle. Walt was just "Dad" at home, he wasn't the world famous Walt Disney. In fact, Diane found out he was "the" Walt Disney from a classmate. He actually drove Diane and Sharon to school everyday until they were old enough to drive themselves. He attended school functions, father daughter dances, and even reserved Sundays to spend with his girls. 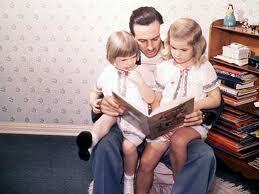 I found this picture of Walt reading to Sharon and Diane at adoptalk.org. Donna, I LOVE that Walt was a genius, an icon, but above all, a family man. You capture this beautifully! Thanks D, I love that too! !